Many roads lead to Mt. View. Arkansas Highways #5, #9, #14, #66 and #87 all pass through Mt. View. It is a destination for thousands of Ozark tourists every year. If you were to follow the White River south from Calico Rock as the Indians, trappers and settlers did, you’d reach Mt. View as well. With a broad view of surrounding Ozark mountains, Mt. View is called ” The Folk Music Capitol of the World” and world class musicians come here every year to participate in the many folk music festivals and events, as well as to pick and play on the Courthouse Square every night of the warm season. The town is peppered with music halls and any given night has someone playing Folk, Bluegrass, or Gospel music somewhere in the town. Craftspeople as well are drawn to Mt. View, where there is the Ozark Crafts Guild and all manner of wood workers, iron workers, glass crafters, quilters, artists, sculptors, writers and poets offer their creations. 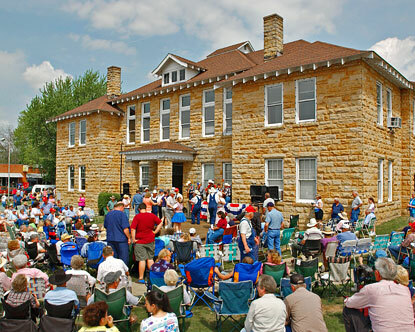 The Ozark Folk center has a focus on traditional crafts and music. They offer classes and demonstrations on herbalism, soap making, bead making and many other traditional skills, as well as having a wonderful auditorium that provides a grand venue for entertainers. There is National Forest all around the town, as well as the impressive Blanchard Springs Cavern just a few miles out of town. Hiking trails and river adventures await those who love the outdoors in every direction in Mt. View and the nearby area.